SPY rose by 1.1% this week, to its highest weekly close since May 2008! I have raised the top of the chart to +14%. My account fell 0.4% to just above its lowest value ever. The loss-floor is now -9.6%. Participant mood: The bears are howling in pain! It looks like the markets will be rocketing to the moon from now until November. This is the “capitulation”, which is followed by the “blow-off top” and then the “crash”. But November is just a wild guess; David Banister predicts that it will end by early September at the latest. Really, the markets will keep going up until some piece of news spooks the herd. What will it be? Volume on the New York Stock Exchange is the lowest it’s been in ten years. There was a large drop (around 20%) that occurred suddenly when Knight Capital went out of business, as if a whole bunch of HFT computers were snuffed out. Falling volume with rising prices is usually a pre-crash sign, but there is no telling how long this uptrend might continue before it turns. US news: The Obama Administration is considering a release of oil from their Strategic Reserve. Last year, they announced a release on June 23. The market jumped for two weeks, then wobbled for three weeks, then plummeted and did not return to its pre-announcement price for eight more weeks. Of course, there was also a debt-ceiling debate at the time, and the official reason for the release was Arab Spring in Libya; neither of these seem to be happening this year. Something awful will have to happen in the Middle East (presumably involving Iran) to justify a release from the reserves. The stock market generally falls at the start of a war due to uncertainty. I still think that Obama wants the market to crash before the election, because low stock prices hurt Republicans more than they hurt Democrats (and nothing else matters to those clowns). But Obama is a weak president and his government often seems to disobey him, so who knows what may happen? Euro news: Chancellor Merkel has returned from vacation and put her foot down regarding the illegal money-printing that was going on at the national banks. The Euro has been falling, which usually causes US stocks to follow suit, but not this time. size: On Wednesday, the size of my SRTY position increased from 15% to 16% of account, even though the position had already been sold by that point, because the denominator (total size of my account) dropped from 8.8% below-start-of-year to 9.1% below. 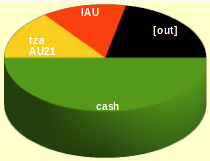 On Thursday, the size of my IAU position increased from 13% of account to 14%, even though the total size of my account did not change significantly, because the price of gold went up a little and the position was already so close to 14% in size. HostMDS: Timeout failures on quote-fetches continued until Thursday, when things returned to normal. Presumably one of HostMDS’s other customers complained and got them to fix whatever it was. I didn’t put in any effort this week towards finding a replacement ISP. Schwab: Although Schwab and OptionsXpress are owned by the same holding company, I still can’t transfer my account from one to the other. They say the legally-approved thing for me to do is open an RSP and then slowly transfer money from the IRA to the RSP, to minimize the tax bite. I don’t want to do that. I have begun the process of opening a TFSA account at OptionsXpress. The money will get taxed when it leaves the IRA but there is no tax credit for TFSA deposits. Profits (if any) *should* be untaxed while they remain inside the TFSA, but the USA doesn’t recognize that kind of retirement account so the legalities are still unclear. I have to open the account (which will take several weeks) before I can find out whether they will allow me to use their API, without which there will turn out to have been no reason to have opened the account. Catch-22! SRTY: Another winning trade for the SRTY model! The win:loss ratio is now 8:11, with a gain of +1.3% over four months. Average return for this model is supposed to be 2.5% per quarter (but only 1.25% average for the second quarters), so even SRTY is doing poorly — still, it is eking out a profit even under these adverse market conditions. TZA: Was bought one minute late because HostMDS was still running so slow; robot got the expected top-of-hour price anyway. On Tuesday, the robot thought it had stopped out, but actually hadn't because the TZA stops are slightly looser than the IWM calculations due to leverage. I added a fake high price to Monday's data archive so robot would know that I still owned this thing. On Wednesday, price got down to $17.20, with my stop at $17.10. Finally stopped out for real on Thursday. Limit order finally filled on Tuesday, with a gap-down so I got price improvement. By then the 50-day moving average had risen to my limit price, so gold bounced there and has been rising ever since. But the price of gold usually moves very slowly, so my account has gained only 0.1% so far on this trade. Last week I predicted that IWM's price would fall back to the red channel line, which it did on Monday. Then I said it would either start heading down to the lower red channel line or it would bounce and “begin a period of serious uptrend”. It seems the latter is what has happened. This may be the “final blow-off top before the crash”. It could go on for months, or it could end next week. The market is nearing “overbought” levels, so I am expecting a downdraft for next week. If it is sharp enough, my URTY model will trigger and I will “ride the bull” for awhile. This week my TZA position had multiple near-death experiences before finally kicking the bucket, with a full loss of my initial maximum risk. I thought that maybe my stops should be slightly looser, but new tests indicate that actually they should be tighter. The table at right shows results for 2008..2011. These results may be somewhat bogus. Tightening my TNA stops by 0.3% seems to produce noticable improvements in profit and risk, with no effect on which trades are winners or loses. The results for TZA are useless. The profit and risk improvements are insignificant. It is unrealistic for me to tighten stops by 0.1%, because other slop in the system often causes reality to differ from my model by more than that. Maybe someday I can get proper quotes from OptionsXpress and set proper stops that don’t involve guesswork multiplication — but not today. Next approach: when prices get *close* to my stop and then bounce, then sell on the next upswing because things will be going bad soon. What counts as “close”? For TZA I tried using ¼ of STDDEV(7) since I have that number lying around and it scales based on market volatility. By this definition, TZA had three near-death experiences this year (late April, early May, and mid-August). It looks like all three of them could have been helped, but there aren’t enough examples to be sure. Oddly enough, backtesting shows no similar experiences in prior years, so clearly something has changed in this market. Experimental rule: If prices get close to the stop and then bounce, then sell the shares manually when the retrace seems to be over (e.g., after the first hour when price moves against me by more than a trivial amount).